Good news for travelers coming over to Bicolandia! 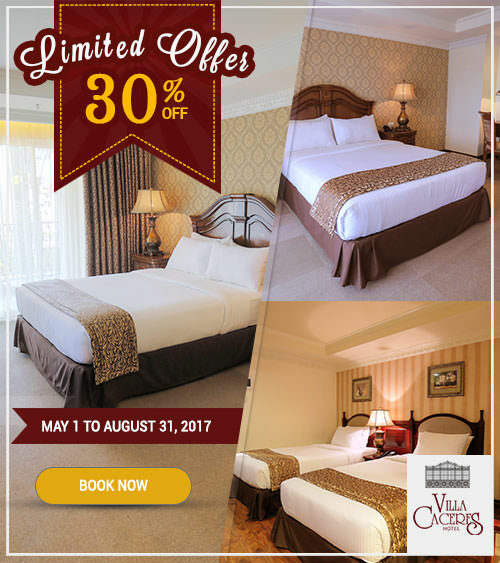 You can now get big savings for your accommodation in Naga City, as Villa Caceres Hotel is giving you a Limited Offer promo. With this deal, you can book select rooms at 30% off its Exclusive Online Rates! Featuring a classic design and modern comforts, the Standard and Executive Rooms of Villa Caceres Hotel evoke refined living. Each accommodation has plush beds, an LCD cable TV, an electric safe, individually controlled air-conditioning, and electric key card access. The room’s private bathroom, meanwhile, has an enclosed shower area with hot and cold water. The Limited Offer of this hotel in Naga City is valid for stays from May 1 to August 31, 2017 only. This deal is only available on the website of Villa Caceres Hotel, so log on to www.villacacereshotel-naga.com to reserve your stay. It’s Raining Deals at Villa Caceres Hotel!